Do you use MailChimp for emailing lists and campaigns? Do you also use an embedded signup form directly on your site for potential subscribers? They also appear in the subscriber pop-up code generated by MailChimp (click to read more about this), BUT NOT in the embedded signup forms. Note the lack of any marketing fields, despite GDPR fields being enabled. And then selecting Form Builder, where you can edit and design your form, and importantly find the Signup Form URL, that you can include on your website to redirect potential subscribers. Alternatively, you could use the Subscriber Pop-up code, also under Signup Forms. 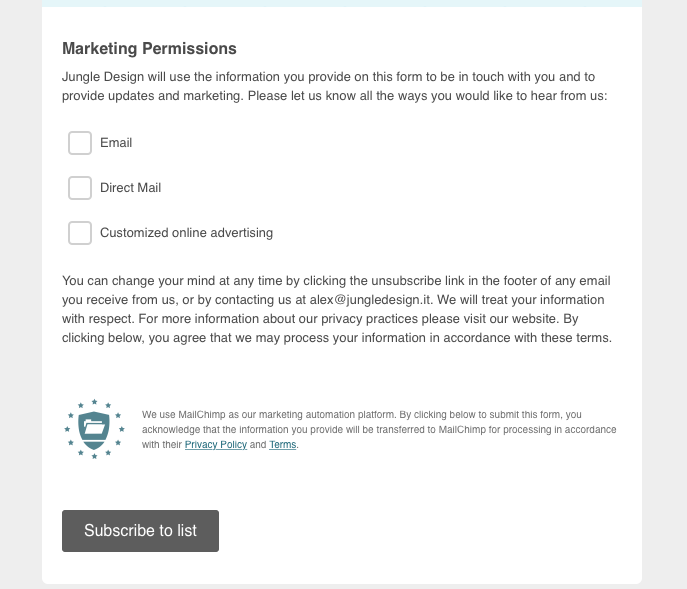 Hopefully this article has helped you to configure your MailChimp Subscriber List so people can easily signup and have the option to tick any necessary permissions. Any questions then please post them via the comments box below!